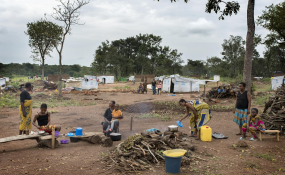 Adagom refugee settlement, run by UNHCR, was established in August 2018 to host some of the Cameroonian refugees living in local communities around Cross River. In early December 2018, it was hosting more than 6,400 refugees. The International Monetary Fund, (IMF) says it is concerned over escalating conflicts which have adversely affected the African region's economy in the last two decades. According to the April 2019 edition of the Sub-Saharan Africa Regional Economic Outlook, released by the Fund, in Washington, yesterday, the conflicts have been deadly, affecting the populations of the affected countries, and negatively impacting their economies. It said: "Conflicts in Sub-Saharan Africa have been deadly. Sub-Sahara Africa has been marred by conflicts during the past several decades, though the intensity, nature and geographical distribution have varied over time. "The region was particularly prone to conflicts in the 1990s, with the number of conflict-ridden countries in the region, about 15 during 1990-99 (about 35 percent of the total number of countries in the region." According to the IMF, although there was a decline in the spread of conflict in Africa by the end of the 1990s, the Sahel region, and the Lake Chad area have been experiencing a recent upsurge, ostensibly due to the activities of the Boko Haram and other Islamic terrorist groups. "Across the Sahel countries, the Lake Chad Basin (Nigeria, Cameroon, Chad, and Niger) has been a particularly significant increase in violence during 2010-2017, for 77 percent of all conflict-related deaths in the Sahel and about 40 percent of all conflict-related deaths in Sub-Saharan Africa", the fund said. The organisation noted that a major consequence of the conflicts has been the displacement of populations with its economic consequences. "A major consequence of the conflicts in Sub-Saharan Africa, as well as, elsewhere, is the displacement of populations. This carries significant economic, fiscal and social costs for the region involved in the conflict, but often also for the nearby regions that host the displaced people," the fund said. It noted that displaced populations from the region seeking help elsewhere either as asylum seekers, Internally Displaced Persons, and refugees had grown from 5 million in the 1980s to a staggering 18 million by 2017. At a press briefing on the Regional Economic Outlook, the Director of Africa Department, Mr. Abebe Selassie, said there were an urgent need for authorities in the Lake Chad Basin and Sahel Region to take steps to minimize spillover of the conflicts. The director said that Africa, South of the Sahara, must work hard to reduce the level of poverty in the region. The IMF had said that nine out of ten poor people in the world would be Africans by 2030. He made a case for a commitment to the Africa Free Trade Agreement (AFTA) by all African countries, as according to him, it would benefit the region, greatly, as finished goods trade intra African trade would increase, as against Africa's mainly commodity trade in the international market.